This article aims to demonstrate that the Teochew-Hokkien People are an independent nationality. This article does not aim to prove that “ Teochew-Hokkien people should integrate into the Zhonghua Minzu or Han Chinese nationality”, or that “Teochew, Hokkien, Taiwan, and Singapore should establish a Pan-Hoklo nationality.” This article does not serve as a value judgment (of course you can all have your own judgments about the facts I’ve laid out), but serves only to elaborate on the fact that the Teochew-Hokkien people are indeed an independent nation. The aforementioned ‘Teochew-Hokkien Nationality’ most accurately refers to people who: have Hoklo (generally from Eastern Guangdong or Southern Fujian in modern terms; and also includes the including Teochew Language) as their native language, adhere to a belief in Matsu, dwell along the southern coast, and lay equal stress on agriculture, fishing, industry, and business (and could truly be called ‘businessmen’ when compared to Han people from the Yangtze and Yellow river basins). This also includes the descendants of these people who, from the Ming Dynasty onward, emigrated to foreign lands (primarily to Southeast Asia). The following sections are divided into discussions of how factors of race, language, religion, culture, geography, and economy distinguish the Teochew-Hokkien people from other ethnic groups, and argue that this demonstrates the Teochew-Hokkien People to be an independent nationality. Groups such as the Hainanese, Leizhou, Putian, and Hoklo speaking Hakka people are racially related to, and / or are historically located among or near the Teochew Hokkien people; as such they could be considered to partially match the characteristics of Teochew-Hokkien people. Therefore this article will not serve as an analysis of whether or not these people are a subset of the Teochew-Hokkien, but rather focuses on describing the distinctiveness of the Teochew-Hokkien nationality from Han Chinese. There is not a widely accepted form of address to describe the Teochew-Hokkien people. Before the establishment of modern China (P.R. China), Teochew people would generally refer to themselves as ‘Teochew People’. The literally meaning of these characters being ‘people from Chau-chow Prefecture’; even though the native Hoi Luk Fung region is not psychically part of Chau-chow Prefecture, the term used both internally and externally was ‘Teochew People’. Hokkien people from Fujian Province (and Taiwan) would generally refer to themselves as ‘Chiangchew People’, ‘Choachew People’, ‘Taiwanese’, or ‘Southern Coastal People’, while outside of the region they were called ‘Hokkien People’. The neighboring Hakka and Cantonese people referred to Teochew-Hokkien as ‘Hoklo People’. In places such as Hoi Luk Fung or Zhao-An where Hoklo and Hakka people lived together, the Teochew-Hokkien People would also call themselves ‘Hoklo People’. In contemporary society the generally accepted terms of address are ‘Teochew-Swatow People’ (for those in Eastern Guangdong Province), ‘Southern Min People’ (for those in Fujian Province), and ‘Hoklo People’ (for those in Taiwan). Because the original meaning of ‘Hoklo People’ referred to all Hoklo speaking people from Eastern Guangdong or Southern Fujian, out of convenience the remainder of the article will regularly use the term ‘Hoklo People’ to refer to the ‘Teochew-Hokkien Nationality’. Racially both Teochew and Hokkien people could be considered a subset of the ‘Min People’. The primary lineage comes from three groups: the indigenous Ancient Minyue People, the Ancient Wuyue People who emigrated south from Zhejiang during the Eastern Zhou, Qin, and Han Dynasties, the people who emigrated during the Eastern Jin Dynasty (Central Plains People and the indigenous Wuyue People). Since the Song and Yuan Dynasties, the population density in the Quanzhou-Putian region has become quite considerable. There has been substantial migration to the Zhangzhou and Teochew regions as well as oversees (including Taiwan). However the current immigrant population in the Teochew and Hokkien regions is quite small and can be expected to assimilate into the Hoklo people — thus we’ll consider it negligible for the present discussion. Modern research on race and consanguinity is relatively limited, but through examining Mitochondrial DNA and phenomena such as the lack of the hangover-preventing ‘Du Kang gene’ we can, at least circumstantially, argue that Teochew-Hokkien people are genetically distinct from the Northern Chinese. Moreover, this difference in Y chromosomes is reflected in the ratios of surnames. In and around Teochew and Fujian ‘Chen’, ‘Lin’, and ‘Huang’ are the three most common surnames. Teochew-Hokkien also have characteristic surnames such as: Qiu, Cai, Zheng, Lai, Fang, Weng, Xu, Zhuang, and Ke. For people from Hubei, Shandong, Sichuan, and Liaoning the four most common surnames are ‘Wang’, ‘Li’, ‘Zhang’, and ‘Liu’. In terms of appearance, Hoklo People are different from other nationalities. My parents are, in most cases, able simply by appearances to distinguish Hoklo and Hakka people from those from other provinces. Personally I’m largely able to distinguish between Hoklo, Cantonese, and people from other provinces. People in the Teochew and Hokkien regions use the Hoklo language (this definition holds Teochew and the Fujian dialect to be types of Hoklo). Within academia in Mainland China this is known as the ‘Min Language Hokkien Region’ (which includes both Teochew and Hokkien segments). According to ISO 639 (an international set of standards for the representation of names for languages and language groups) the ‘Min Language Hokkien Region’ and the ‘Min Language Leiqiong Region’ (which includes the Leiqiong dialect as well as Hainanese) are classified together as an independent language called ‘Min Nan Chinese’ (ISO 639-3 code: nan). Regardless of how the specific boundaries are drawn however, Hoklo (or ‘Min Nan Chinese’) — no matter where it is spoken and who is speaking it — is a completely unintelligible, fundamentally different language than Mandarin. The modern lexicon of Hokkien is comprised of three major sources: a small amount of residual vocabulary from the Ancient Minyue language, a significant portion of words from Classical Chinese of the Eastern Jin dynasty, and a number of words from the formal vocabularies of Middle Chinese from the Tang and Song dynasties. Conversely other languages in China (e.g. Cantonese, Wu languages such as Shanghainese, and languages from Hunan and Jaingxi) are comprised primarily of words from the Tang and Song dynasty languages, with a few words from Classical Cantonese. This points that Hokkien and Mandarin split apart during the Eastern Jin dynasty (about 1600 years ago) and developed independently. This distance is about the same as the difference between Spanish and Romanian, or between English and German. Matsu is a belief which is characteristic of the Hoklo People. 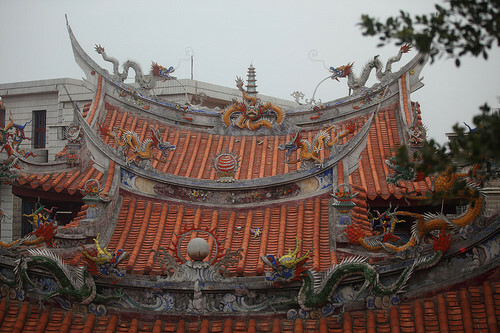 Matsu temples are found all throughout Teochew, Fujian, and Hainan. Since the Ming and Qing dynasties the boats of Hoklo merchants and fisherman would sail as far North as Tianjin and as far South as Java; this led to the misconception that ‘Matsu is the religion of the coasts’. That’s simply not true. In fact the Matsu temples found in other regions came along because of the Hoklo People. As other peoples lacked a seafaring tradition, the idea of Matsu as a goddess to protect those at sea simply could not originate outside of the Hoklo. For example, the English the term ‘Macau’ originates from the A-Ma Temple, which was built by Hoklo sailors during the Ming dynasty. What’s more, the distribution of Matsu temples in Taiwan is often used as a correlate in estimating the historical distribution of Hoklo and Hakka people in the region. In the early modern period (around the 1940s) in Teochew a new religion developed called ‘Tek-ism’, which still has followers in Southeast Asian to this day. Tek-ism holds Kwan Ti as a diety. Kwan Ti stresses the importance of reason and good sense and is the god of wealth and the military, thus his following is widespread among Hoklo merchants and mobsters. 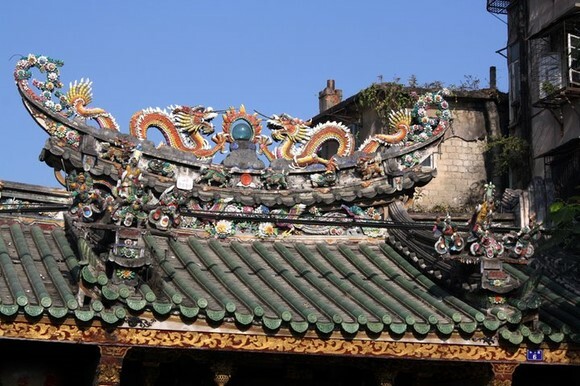 In the old city center in Shantou, the two oldest buildings are the adjacent Kwan Ti Temple and Tin Hau Temple (commonly known as ‘Matsu’s Palace’). The Hoklo practice of combining seafaring tradition and Business Thinking, as in the beliefs in Matsu and Kwan Ti, is something rarely found among other nations and peoples. 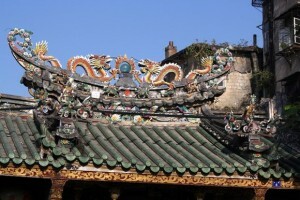 The following figures are photos I took of the roofs of the Kwan Ti Temple and Matsu’s Palace in Shantou as well as the Kwan Ti Temple in the old town section of Chongwu in Fujian. Cultural issues are a bit more fine grained, so I’ll only give a few brief explanations. Hoklo shrines and temples have consistent differences from the styles in other regions: the roofs are high and slanted with exaggerated but finely-detailed decorative inlays of wood and porcelain. (See the above picture of the Kwan Ti Temple). Hoklo people love to eat little cakes called ‘Kway’, and they’ve developed many different kinds. Hoklo people also hold seafood in very high esteem, often consuming it raw or marinated – a practice seldom found elsewhere. The four prefecture-level cities of Teochew and three of Hokkien are the principle geographic region of the Hoklo People. 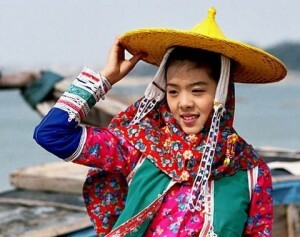 In Taiwan as a whole, and specifically in the coastal plains region of Western Taiwan, the Hoklo People account for the majority of the population. In Singapore, Penang, and downtown Johor Bahru, the Hoklo also constitute the majority group (Kuala Lumpur and Ipoh among other cities are primarily Cantonese and Hakka). In the metropolitan areas of Bangkok and Manila there are also significant numbers of Hoklo (or part Hoklo people); and in such areas the Hoklo tend to be among the highest socio-economic status groups. Thus even with a conservative estimate, there is a large chunk in Eastern Guangdong, southern Fujian, and Taiwan in which Hoklo People comprise the majority of the population. The economy of the Teochew and Hokkien regions has always attached great importance to the traditions of oversees colonization and business. Before the Chinese central government opened up to free-trade and there a ban on maritime trade, this business was considered piracy. From the Zayton port of the Song and Yuan dynasties, to the Wokou pirates during the Ming dynasty, to the wave of migration following the Treaty of Nanking, to the spontaneous rise of the port cities of Amoy and Swatow, all of these things reflect the ways in which the economy of the Teochew-Hokkien region has differed significantly from that of China Proper, and also the regions around the Pearl and Yangtze River Deltas. What’s more, the Economic Spheres of the Teochew-Hokkien region are also divergent. The vast majority of imports and exports at ports in Swatow and Amoy in the last thirty years have come from Fujian, Guangdong, Taiwan, and Southeast Asia, with only a small portion from Japan, Korea, and the rest of China. This differs significantly from China’s traditional Economic Sphere. Since the implementation of the Reform and Opening policy, the development of Teochew-Hokkien has also been distinct from the Pearl and Yangtze River Deltas (not to mention the rest of China). Outside of just the practice of village owed enterprises, the Teochew-Hokkien region also has all kinds of maritime smuggling syndicates, under-the-radar betting and gaming companies, and fully-functioning underground banks offering deposit-taking, lending, and foreign currency exchange services. One would be hard-pressed to find other examples of this type of economic model in China outside of Teochew-Hokkien region and Wenzhou. For any nationality, self-identity or ‘Ethnic Awareness’ is an often overlooked but nonetheless very important underlying factor. Firstly, the self-identity of Hoklo people is a very complex issue. Hoklo people carry on the nostalgic legacy for the ‘Central Plain’. Unfortunately there are now large cultural differences inherent between the two people; when Hoklo people actually have meaningful interactions with contemporary citizens from the ‘Central Plain’ (broadly around modern day Henan province) those nostalgic ideals quickly fade. In fact, even just within Hoklo people there is not just one singular quantifiable pan-Hoklo identity. Even so, among Teochew People, Hokkien People, and Taiwanese People there is, internally at least, a very strong sense of self-identity. In regions of mixed backgrounds, all one must do is utter a simple sentence in Hokkien saying ‘We’re family’ and there is instantly a feeling a togetherness – whereas for outsiders that just might not happen. Before 1949, ethnic awareness had been aimed mainly at the idea of Hakka people as outsiders. In Hokkian, Teochew, and even Taiwan and Malaysia, the linguistic and cultural differences between Hakka and Hoklo peoples has led to continuous fights between the two groups. These ‘generations of hate’ still had an impact even up to the modern era. Yet in modern and contemporary history, ethnic awareness is primarily aimed at ‘mainlanders’ (those who aren’t Hoklo, Cantonese, or Hakka). These ‘mainlanders’ are known as by a variety of different terms including ‘outsiders’ (in Teochew), ‘Northerners’ (in Hokkien), or even ‘Chinese pigs’ (by older Taiwanese). In the Teochew-Hokkien region these outsiders occupy the lowest levels of society while in Taiwan and Hainan they stand on the upper-echelon. Regardless though of the relative positions, in each case these terms establish a dichotomy between ‘my ethnic group’ and ‘anyone not in my ethnic group.’ In the 228 massacre in Taiwan as well as 2011 Chaozhou Riot there were issues of identity; “Can you speak Hoklo?” served as a dividing factor between groups amid the escalation of the conflicts. In the beginning of Taiwan’s Democratization Movement, and connected with the Hoklo struggle for independence, all the leaders of the democratization movement were Taiwanese, and they all used Hoklo in giving their speeches. There is also a strong connection between ethnicity and political affiliation. During the democratization movement, over 90% of the so-called ‘outsiders’ voted for the Kuomintang and the New Party – which is to say ethnic conflict had already risen to a higher level than supposed ‘universal values’. (although currently both parties attempt to deny the existence of such ethnic conflicts). This highlights the strength of the Hoklo People’s self-identity on a regional scale. The Teochew-Hokkien People possess a unique culture and language. They have an economic model and ideology distinct from others, a strong sense of self-identity, and they exist as the majority population in several areas, even in entire countries and regions (Singapore, Taiwan). For all the reasons above, the Teochew-Hokkien People are an independent nationality. Seriously interesting. Why is it that the average Teochew or Hokkien person is so against these kind of ideas? On another note, why not refer to Amoy and Swatow that way throughout instead of using Xiamen and Shantou? As for the Xiamen-Amoy issues, you are right. This article is actually written by my friend and he may not totally familiar with the differences. I just correct them. Throughout the website, I will always use Hoklo names instead of Mandarin names with a few exceptions. Firstly I need to know what kind of Teochew and Hokkien people you are talking about. Are you from Singapore or Malaysia? I think I don’t need to explain how Taiwanese Hokkien hate the Chinese. In Teochew region and Hokkien region, the Chinese Communist Party government is even worse than the Chinese Nationalist Party, and the population of Chinese invaders in Teochew and Hokkien region is much larger than the population of Chinese invaders in Taiwan. We just simply hate the Chinese, including the criminals and the bureaucrats. My supporters among normal Teochew and Hokkien people in Teochew and Hokkien region are enormous. For you Singaporean or Malaysian Teochew-Hokkien, it is easy to explain why you think yourselves as Chinese. Just ask yourself how many real Chinese have you ever know in your real life? On the other hand, Singaporean and Malaysian people are mostly victims of the evil muslim aborigines. The Malaysian muslim still enforce racial persecution policies against Hoklo, Hakka, and Cantonese Malaysian. In one word, Singaporean and Malaysian people are closer to evil Muslim but far from evil Chinese, nobody can convince them the fact that there are three nations (Russia, China, ISIS) in the evil axis of the current world. russia, isis and china? whilst i dont like any of these groups, i actually still think the global zionists are a much bigger evil in this world. have you dont any research on zionists? and how they subvert and mess up western civilizations and any country they infiltrate? that being said its still interesting to hear from your perspective. i dont know whats going on in china and i didnt used to support it but now i support a independent hokkien/teochew state. you could probably get the support of singaporians and malaysian hokkien/teochew/cantonese as well if you spread the news over there and explain that the northerners treat us like crap. because we are dumb enough to fall for the han supremacy BS that we are taught from birth. and we are dumb enough to think that we ourselves are han or that the northerners see us as one of them. i thought like that before as well . i was guilty of this as well. when your parents raised you like that and when society around you raises you like that its hard to get out of that mentality. and even after the one child policy was lifted ive noticed that the propaganda in the south and the north are different. in the south , the media(like guangzhou daily) tells people that having more kids is bad for them because of anxiety and other stuff. but in the north they only say good things about having kids. even xinhua did that. when they say negative things about having kids the article is set in a southern area like guangzhou but when its positive things about having kids the article is set in a northern area. suspicious isnt it? id say they want southerners gone and want to replace the land with more northern chinese. i dont know chinese and i dont know how to talk to mainland chinese or excess their websites. but if anyone else does know they should spread this message around to other cantonese and hokkien people. maybe even people in yunnan and guangxi etc. Thank you so much to help me defend my article. I am from the city of Swatow. I am quite familiar with the situations there. Yes, there are HUGE divide between the Chinese and the Teochew. The Chinese look down upon us and refuse to learn our language and culture. There are many 2nd+ generation Hakka people in Swatow, but they speak and Teochew and everyone treat them as Teochew. Also after 1980s many Hokkien people (mainly from Southern Chiangchew because they are closer to Swatow comparing to Amoy) moved to Swatow for better business and employment opportunities. They can easily adjust to Swatow accent and nobody consider them Chinese. Yes there are divide between the Teochew and the Chinese. And the divide are not purely based on ancestry. What’s your definition of Chinese? I’m Teochew/Swatow (salute), but I always thought I was Chinese. I’m so confused, especially with the Taiwanese and the HK people and the Shanghai people saying they are not Chinese. Which Chinese look down on us? Never heard of anyone looking down on Teochew/Hokkien, rather it is always envy. They like to make fun of the southern Mandarin accent and mock anything they can in general, but that’s so retarded I can’t take them seriously. I do know some Beijing ordinary people who try to defend Southern Chinese though. I think there are some good people in the north. It’s the miserable people that behave badly, usually they are from the lowest social stratum, and with face being so important in China, they are really suffering. It’s not an excuse, but it helps me to understand their poor behavior. For the most part, I think Northern Chinese are just jealous of Southern Chinese because we are better off in most things, and their fragile ego won’t let them admit it. So they try to make fun of the height and appearance of Southern Chinese, but that’s again so stupid I can’t take them seriously. It would be nice if you could tell us more about Swatow. I’m sure there are lots of Teochew like me who are more fluent in English than Chinese, and information on Teochews is scarce in English. Thank you! Oh, I get it now. You mean those Northern Chinese like to say that all other Chinese languages except Mandarin are uncivilized, right? That’s not real looking down though. It’s just a political tool. Because obviously Teochew being older and better-preserved, is more civilized than Mandarin, which is a relatively new language. I’m starting to think Mandarin is not my language, so why do I need to know it? My language is Teochew. Thanks for reminding me of my roots. So I think if I know English and Teochew, that is enough for me. I don’t care to study Spanish, which is spoken by a lot of people in the world, too, so why should I care to study Mandarin. I realized that Chinese can’t be an ethnicity, but it is just a nationality. For example, if you check the DNA from the Northern and Southern Chinese people, you will find they are vastly different. So they are a different people altogether, with different roots. They are a different race altogether. This does make a lot of sense, and it explains why Southern Chinese are so different from Northern Chinese. I don’t know why Northern Chinese like to brag about their height, because they sure don’t have much to say in the brain department. That’s why Northern Chinese think violence is a solution to everything. They can’t activate their brains, so they always activate their muscles. I heard Shanghai people say, it’s okay if they’re not Chinese (中國人) but they will always be Shanghai people. So if such a thing can change so easily, it’s just a nationality. Thank you for your replies. I believe you get our messages now. (1) There is no motivational difference between envy and hatred. Yes, it’s just silly envy when you look at ordinary powerless Chinese people who hate Teochew, Hokkien, or Cantonese. (They can’t tell the difference actually.) But it is a different story when you look at the Chinese governments. Their envy or hatred is the same as the ordinary Chinese but they have, and use the power to destroy us. Of course there are many nice Chinese people. You know there are 1 billion Chinese people. It shouldn’t be too difficult to find 1 million good people in China. But it doesn’t mean anything. Also your personal experience may be biased because Chinese people will treat you better if you have foreign citizenship. They treat Teochew people with Chinese citizenship much much worse. (2) Yes, Teochew and Mandarin are two different languages. I feel sad when I see oversea Teochew learning Mandarin and feel like they are finding their roots. It’s the opposite actually. They are learning the language of our enemy who want to destroy our language, identity, and society. Personally I speak Teochew, Hokkien, Cantonese, Mandarin, Japanese, English and I am learning French. For me Mandarin i just another foreign language. (3) In my opinion, “Chinese” is not an ethnicity, it’s more like a civilization concept, just like “Christian” or “Muslim”. It’s a civilization, or a way of life, which is shared by many ethnic groups. When Teochew, Hokkien and Cantonese people meet Muslim Malays or Christian Westerners, it’s normal to say we are Chinese, but it doesn’t mean Teochew and Mandarin people are the same ethnic group. Just like Irish and Georgian are different ethnic groups even though they are both Christian nations. though i was going to say that liberalism isnt exactly a good thing as well because multiculturalism can destroy countries especially when you see what has happened to europe. but then i read what you wanted and you basically want a hokkien state with strict immigration laws. so basically why dont we just become part of taiwan then? taiwan is as close to a hokkien state as you can get. though they are starting to have a lot of silly SJWS there who are making the same mistake as the western SJWS in thinking its a good idea to take in muslim and african immigrants/refugees. ugghh. No, you are totally wrong. The clothing is traditional Teochew clothing. But their existence are shrinking. After Manchurian invasion people are forced to wear Manchurian style clothes. Even in Qing Dynasty those cloth only exist in remote area. And in the past 200 years many people began to wear Western style clothes. Maybe your grandparents wear American style T-shirt, Western style shirt or jacket, or Manchurian style Changshan. But it doesn’t mean what I showed in the picture is not Traditional Teochew clothing before Manchurian invasion and Western influence. There are barely any Taoist in Teochew or Hokkien. Buddhists and Christian exist, but are only a small minority. Most people look down upon Buddhists. The vast majority worship Matsu and local gods. Since these are not real strong and organized religions, most people just don’t know how to classify their belief system. So they put Buddhist or Taoist when surveyed because that’s the only East Asian religion you can choose in the survey. BTW, what’s your other half? Chinese? my other side is hokkien. though i suspect my hokkien side has more han blood than my teochew side just from appearances only. im not against a hokkien state. actually at the time i read this a few years ago i didnt really understand where you were coming from but now i do. it would be difficult to convince enough people to join your cause though. chinese nationalism (particularly han nationalism) is at an all time high in china including in the south. the best chance you get is taiwan . maybe fujian and guangdong can become a part of taiwan eventually. or if that doesnt work then just spread liberalism in china so that they learn to be more accepting of other minorities or cultures in their own country. i dont normally like liberalism because it has resulted in the destruction of western civilization because of the immigration of so many bad migrants from africa and the middle eastern countries but if liberalism can help us in china i say we push for it. though i do worry about zionism as well. do you know about zionism? the secret israeli agents that control other countries from behind the scenes and promotes multiculturalism everywhere else except for israel? (american and european govts and media is completely controlled by israeli duel citizens) i partly hesitate to break apart china because they are the last thing standing in the way of total global zionist control right now. Teochews are not Han. My Teochew elders outside of Mainland China who speak Teochew exclusively but not Mandarin have never even heard the term “Han.” I heard the elders ask each other, are we Han? If you have to ask, you are not. Hi friend, I am a Hokkian who grew up in Amoy. I have the similar idea as you, how can I contact you and have a further discussion? If you need to send us any private comments, our email is hoklo.republic at gmail.com . Thank you. I’m afraid you can count Teochew in Bangkok or elsewhere in Thailand as part of a new nation because they are assimilated and become Thai by now. only some older generations still refer to themselves as Teochew, speak Teochew and know Teochew traditions. Thank you. Yes, I agree with you partially. About half of Bangkok’s population and almost all of Bangkok’s upper class are racially Teochew. Actually I have relatives in Bangkok. I can only speak to them in English now. But comparing to the Chinese governments or the Muslim governments in Malaysia and Indonesia, Thai governments don’t have any discrimination policies against Teochew. Teochew are treated equally as Thai citizens. Another problem is, just like what’s happening in Latin America, there are a lot of race mixing happening in Bangkok. Many people are half-Teochew half-Thai. They all live together. It’s impossible to build any nation state there without multiple racial groups. The just deceased Thai King Rama IX handled the problem quite well and make Thailand become the second best country right after Hoklo majority Singapore. However, the Republic of Teochew and Hokkien will treat all racially Hoklo people in Thailand as our brothers and sisters. And we welcome all kind of contributions to our republic, material or cultural. Hmm…No Thai of Teochew descent has forgotten their Teochew roots. They call themselves Thai, just like the Teochews in the US call themselves Americans, but if you ask for ancestry, they will say Teochew. Do you know any websites teaching teochew in traditional Chinese characters for the English speaker? Thank you for your website. It is very interesting. Why did you use hoklo to describe hokkien/teochew people, that term was kind of insult word created by hakka when they called hokkien/toechew people. Banlam/minnan will be more accepted for me. I am a Chawan larng.My Taiwanese friend describe me as Hololarng . Chawan people speak hokkien chawan(since its in Hokkien Zhangzhou and should not be mistaken as Hakka though my chawan hokkien grandpa marry a chawan hakka. .Imho Hakka came from the central plain and settle in zhao An many years back but because too many Hakka later settle in taiwan so many Taiwanese think Zhao an people are all Hakka which is wrong. In my current country many no longer know which dialect group they are from except older generation who may know whether they are Hokkien, Teochew, Cantonese , Hailum , Hockchew or Hakka . Not many know theres Hokkien Chawan here except those like me. I communicate in Hokkien Chawan here daily with chawanese here. theres something i like to add. if we want to get the support of teochew, hokkien and cantonese people (or hell just southern people in general) we can tell everyone about how we have to pay higher fines than the north to have a second child (before 2015)look it uphttp://www.allgirlsallowed.org/sites/default/files/One-Child%20Policy%20Fines%20Relative%20to%20Income%20Levels%20in%20China%20-%20A%20Report%20by%20All%20Girls%20Allowed.pdf and even after the one child policy was lifted ive noticed that the propaganda in the south and the north are different. in the south , the media(like guangzhou daily) tells people that having more kids is bad for them because of anxiety and other stuff. but in the north they only say good things about having kids. even xinhua did that. when they say negative things about having kids the article is set in a southern area like guangzhou but when its positive things about having kids the article is set in a northern area. do we all have a facebook page. Can we all form a Holoh nation or society. Let’s discuss in facebook would be idea.